Energy generated from wind is now an integral part of the power supply for all major economies and it is composites that form the rotor and capture the wind. 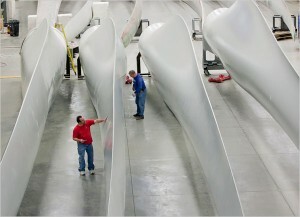 The blades have grown in length to over 70 metres as the market matures and moves offshore. All aspects of this vital windmill component are being refined from design to finishing, maximizing power output and minimizing maintenance. The fourth AMI annual global forum on Wind Turbine Blade Manufacture 2013 takes place from 3-5 December 2013 in Dusseldorf, with top speakers from across the industry. The overall aim is to improve energy output performance and cut production costs, so that the wind energy industry improves its competitiveness in the marketplace. There is a new IEC 61400-5 standard for design and manufacture of rotor blades, which will be reviewed by LM Windpower. Composite materials can be tested as well as whole blades: Professor Brondsted of Wind Energy DTU has test protocols for mechanical and other properties, while Euros has developed ways to examine the modulus of the matrix in situ. One of the top wind turbine makers, GE, is reviewing blade structures and will outline a new research project on tension fabric blades. Nordex Energy is using simulation software to analyse the manufacturing process. The reliability of renewable energy supplies is critical to the long-term uptake of the technology worldwide. Wind Turbine Blade Manufacture 2013 brings together global experts in rotor manufacturing to discuss the latest technology in design, manufacture, materials and testing for the windmill blade industry. There are new materials under review from resins to coatings. The latter are being developed to combat erosion, which can be caused by the higher speeds of larger offshore blades and by the impact of rain and hail. The programme also reviews issues with ice in extreme climates and methods of protecting the turbines – lightning strike protection is another topic on the agenda. Design is a key focus and some of the latest research has been carried out by Aeroblade who have been applying aerospace lessons to wind energy. From the blade makers, Aerodyn Energiesysteme has been examining the challenges and design limitations. 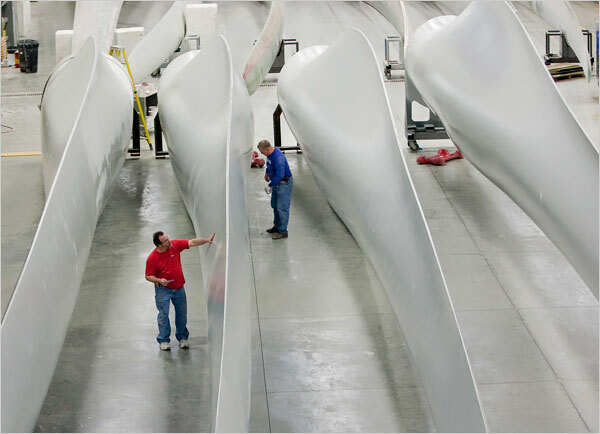 Materials and innovation experts Smart Blade and 3M have worked together to develop an added component to optimize the aerodynamic performance of wind blades. Outdoor construction always has to be weather resistant and wind turbines are included. For Canada to really expand its wind energy the effects of ice need to be reduced and this issue has been studied by the lead Wind Energy Research Laboratory in the country based at the University of Quebec at Rimorsky. In Norway Re-Turn is testing microwave-heatable coatings for de-icing. All parts of the world are affected by lightning strikes: Global Lightning Protection Services in Denmark has developed technology for the protection of complex blades. Another factor is erosion from the increased speed of larger blades and rain, hail and snow impact – this is where the coatings manufacturers like BASF Coatings are directing studies. The renowned composites company, Gurit, has reviewed the factors affecting adhesive joints in wind turbine blades. From Spain, Indeol has developed an advanced joint system for modular blades, which help resolve the issues of transporting very large structures.In terms of resin, Momentive Specialty Chemicals has tested the impact of the hydrophobic nature of the resin on laminate quality and there are new epoxy systems from Aditya Birla Chemicals. Fraunhofer IWES has reviewed blade reliability comparing certification and field experience and Sika Services has looked at solutions for repair and maintenance of blades. Blade buckling can be an issue: Dr Stoll of Milliken has studied the optimal selection of sandwich core for buckling resistance. There are new approaches to the non-destructive testing of blades from Mistras GMA Holding. AMI’s Wind Turbine Blade Manufacture 2013 conference is the annual debating and networking forum for the wind energy industry to review the performance and future prospects for composites components.